The article below was originally posted by David A. Haigh of Lawrence Livermore National Lab on the PTC/User Forum site. 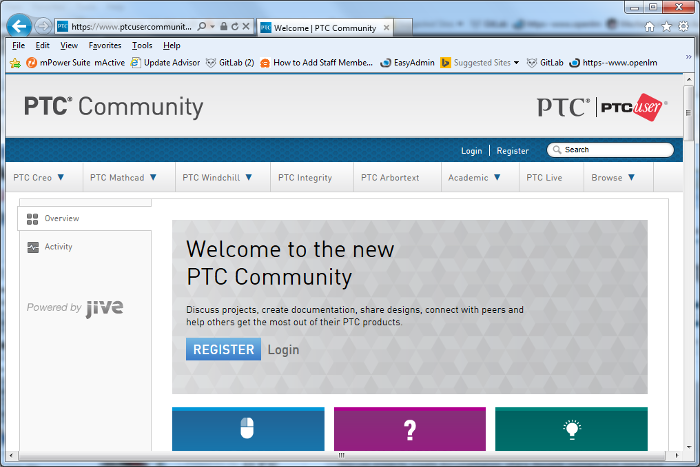 The article provides helpful instructions on how to set-up email streams on the new PTC Communities. A special thanks to David for allowing us to repost on the Pro/Users of the Carolinas site. Log In first. Then set up a new stream pick by picking New Stream from left side of the page. Enter a name for your stream and pick done. When you pick on a stream, you get a gray gear icon to the right of the stream name. Picking on the icon gives you a menu which will let you edit the stream. Picking on the gray Off toggle next to Email updates: will change it to a green On. So it’s showing the current state, not what you will set it to. That’s it for setting up email notifications. But since these streams are not following anything that’s what you need to setup next. Along the top of the page are a series of Tabs. Some have pulldown menus. These are also buttons. So picking on PTC Creo or PTC Windchill takes you to the parent category. When you pick on it you get a menu that allows you to select which stream you want to follow that category in. Select only the stream you want to follow the category in. Following a parent category like Creo, doesn’t follow any of the Communities under it. You will have to select those individually. But you can follow them in the same stream. Go to each community you wish to follow and do the same process, assigning it to the stream you want it to appear in. Before you create your filters in MS Outlook, you need to create some folders to sort the incoming emails into. Hi-lite your Inbox, and from the RMB menu pick New Folder. Name the folder. In my case I made two folders. The incoming emails will have the following in text inclosed in square brackets in the subject line. So you can filter on any or all of them and move them into separate folders or the same folder. In MS Outlook, the File, Info, user interface has a Rules and Alerts button. Picking on that brings up this interface. Pick the second item, “Move messages with specific words in the subject to a folder”. Pick OK to return to the previous dialog. Just a reminder, the streams I set up were [Creo] & [Windchill]. Here we are just entering the filter for Creo. Browse to the folder you create for this stream, Select it and pick OK.
Repeat this process for the other streams you created. Now from Send/Receive tab in MS Outlook pick Run Rules Now. Any emails you have received from your streams should get moved to the new folders. That it. Your now set up to receive email notifications from the PTC Community and have them nicely filtered into sub-folders in Outlook.